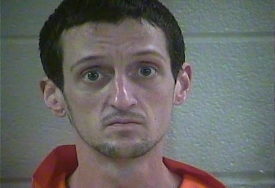 LONDON KY—On Tuesday, May 2nd London Police arrested Brian D. Kinney, 34, of Keavy on a warrant regarding second-degree wanton endangerment and fourth-degree assault of a child. During the arrest, Det. Sgt. Joe Smith discovered methamphetamine on his person. According to a complaint made on April 24th to London Police Special Victims Det. Stacy Anderkin, Kinney wantonly engaged in conduct which created a substantial danger of physical abuse to a 10-year-old on Sunday, April 16th, 2017. The complaint stated that Kinney forced the child to stand beside him as he covered a spark plug in gasoline and ignited it with a lighter. As a direct result of Kinney’s actions, the 10-year-old’s shorts caught on fire, which caused second-degree burns to the child’s let upper thigh. Kinney did not seek immediate medical attention for the child. Due to the severity of the burns, the child is having to receive skin graphs from a burn center. When Kinney was located shortly after the complaint was made, he received a pat-down search and was asked if he had any weapons or drugs on him. Kinney then quickly pulled something form his pocket and bent over facing away from the officer in attempt to conceal or throw an item as well as refused to give something in his right hand to the officer. A pill bottle was recovered from his hand that contained .3 grams of a crystal substance and an empty Suboxone package. Kinney was arrested on the warrant charges and for first-degree possession of methamphetamine, of the first offense. He was lodged in the Laurel County Detention Center.